Earlier this year (and a little behind the times) I got turned on to Kiva.org, the “social clearinghouse” for matching pools of small ($25 a pop) lenders with individual borrowers in developing countries. Kiva’s process of pairing lenders with borrowers is described here. Kiva fills a critical niche in breaking the lending process down into bite size chunks for lenders, screening and qualifying “in-country” partners (the actual lending institutions, to whom Kiva’s members effectively provide collateral). 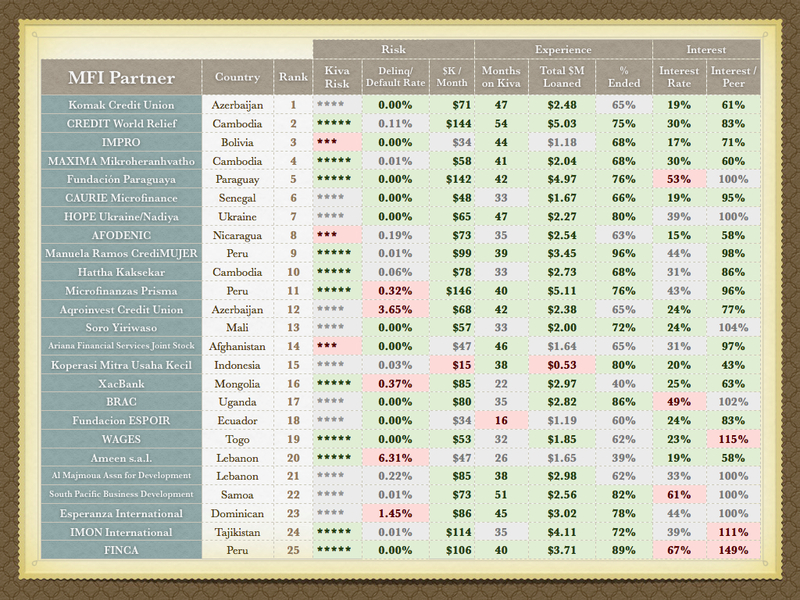 I have been wanting a way to help identify the most “solid” of the in-country partners to lend with; in the “study” shared here, I have scraped a large amount of microfinance institution performance data and combined them into figures of merit, to attempt to somewhat objectively rank the Kiva partners. Microfinance lending is not without controversy; some are opposed to the practice on principle (suggesting any collection of interest from the poor is immoral, implying that presumably direct charity is preferable), others have difficulty with the magnitude of interest charged by many MFIs (both a direct by-product of very small loans, and the implementation overhead of executing and managing the loans in countries with limited infrastructure). The New York Times has run a fairly well balanced story on the pitfalls of microlending’s rapid global growth. Kiva itself is not-for-profit, and Kiva lenders do not collect interest (although their MFI partners do). Kiva does a very good job at both screening partners and providing transparency by documenting their charters, performance, performance vs peers, and a host of other data, including linking to detailed financials at miX Market.org. Kiva currently partners with 154 MFIs (8% of those listed on miX Market) and attempts to focus on credible partners focused on development. That said, the process of using Kiva’s data to make informed decisions about downselecting among Kiva’s 154 can still be a little daunting. To help, I racked and stacked Kiva’s reported data to generate metrics on the “best” (my very qualitative term) MFIs to support. (Here is an example of the data available on a Kiva lender page). Note that these metrics provide a number of indicators beyond Kiva’s simple “star rating” risk score. Either table might be useful for repeat Kiva lenders who take advantage of the site’s auto-loan feature. 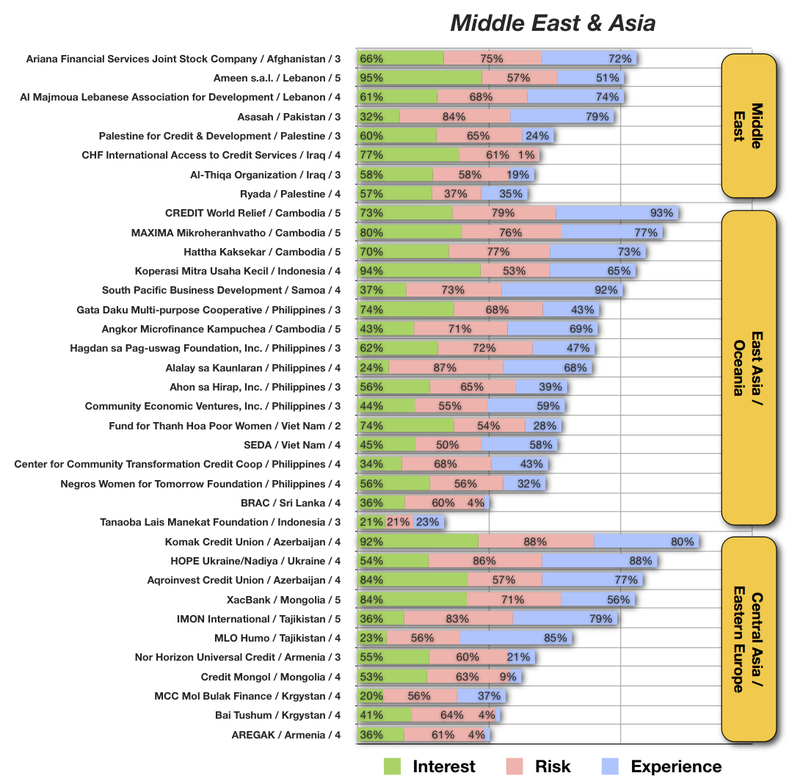 I suspect a lot of folks prefer to lend to specific region, so I’ve included graphs of all lenders for each of three main regions (the Americas, Eastern Europe / Middle East / Central Asia / Asia, and Africa). In these graphs I have normalized the sub-metrics and rolled them up into three “meta-metrics” (Interest, Risk, Experience) for display. 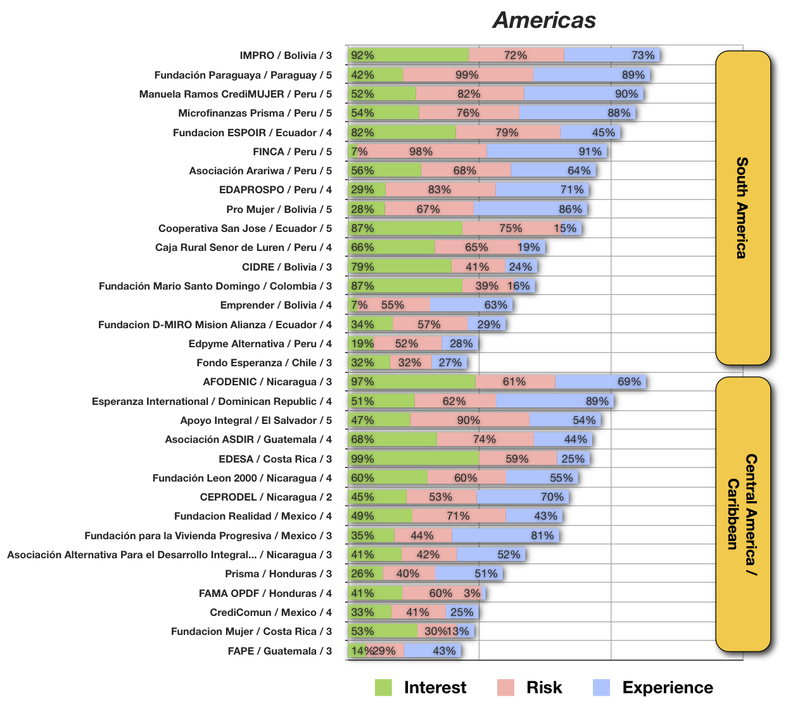 I’ve included experience as the “rightmost” inset bar, as some lenders might be more willing to take a chance on new / emerging MFI’s (low Experience scores) whose Interest and Risk scores are nonetheless good. 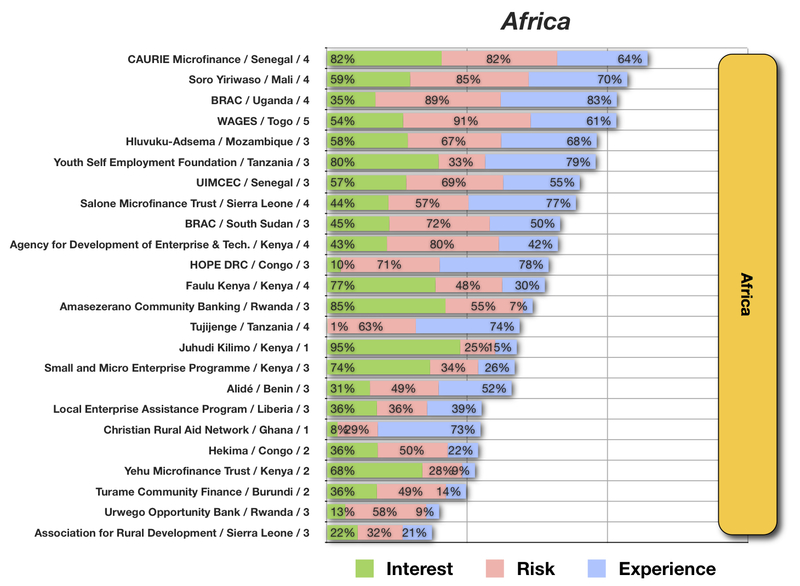 As a region, the African MFIs seem to struggle the most with both interest and risk (not surprising when scored on a global basis). I cannot help but wonder whether in regions as challenged as Africa, outright charity might not be a better answer than attempting to implement microfinance in a low-infrastructure and high-instability environment. This scoring system was constructed strictly for my personal use and does not imply an endorsement of any MFI or its practices beyond its metrics. I’m offering it on the off chance that someone else may find it useful (or even better, improve upon it!). 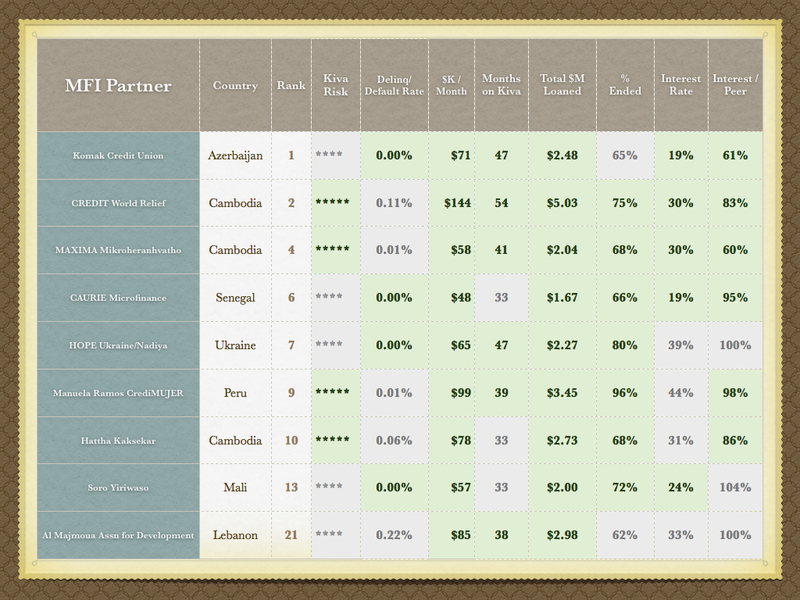 Since Kiva is effectively a charity exercise anyway, I plan to use this ranking only to loosely guide my own lending. The metrics are definitely skewed towards the conservative side (lower risk, more established players) which may not necessarily reflect areas of greatest need, or high performing “upstart” MFIs that have not yet had time to prove themselves. To loosely follow the model of traditional “investment”, I think the best approach is to maintain an informed and balanced portfolio across a range of risk and performance. Your mileage may vary! But if you’ve read this far, please think hard about supporting Kiva. Really enjoyed this – nice work. Thanks very much! I’m glad it was helpful!